By my non-scientfic evaluation, folders are the most underused part of iOS 4.2 (or earlier for the iPhone). I’m simply amazed whenever I see someone’s home screen littered with single icons. Now, I’m not advocating relying solely on folders; one-click access to frequently-used apps (Mail, OmniFocus, and my current favorite writing app) is great, but grouping second tier apps into folders is an equally good idea. Thanks to the introduction of Folders, I can easily group similar apps. Anything related to Reading (e-books, Goodreader, Zinio, Instapaper, etc.) are in Reading. My text apps are all in their own folder, as are the iWork apps. I’ve taken six or seven app screens and reduced it to one. Creating a folder is easy: simply drag one app icon onto another icon and iOS will automatically create a folder and give it a name based on the category of app. Marry two game apps, and you’ll get a folder named Games. You can rename this folder to whatever you like, so you’re not stuck with the name Apple gives you. You can also perform this task directly in iTunes by going choosing your iPad in the sidebar, clicking on the Apps tab at the top, and then dragging icons on top of one another in the same way you would on your iPad’s screen. For when you’re setting up folder for the first time, iTunes is the best way to move a ton of apps around. There are a few problems I’ve run into with folders. The first is, even though there are open spaces on my home screen, when I install a new app, iOS wants to install it onto screen two. It’s also entirely possible to get into the “Where did I stick that app?” trap. Thankfully, for an easy solution to that problem there’s Spotlight search. If you swipe to the right at the home screen it will bring up Spotlight search. Type in the name of the app you want to launch and it will show up in the search results. Click on that icon to launch it. Also, while not in the scope of this post, Spotlight is a good way to search within some apps, too. 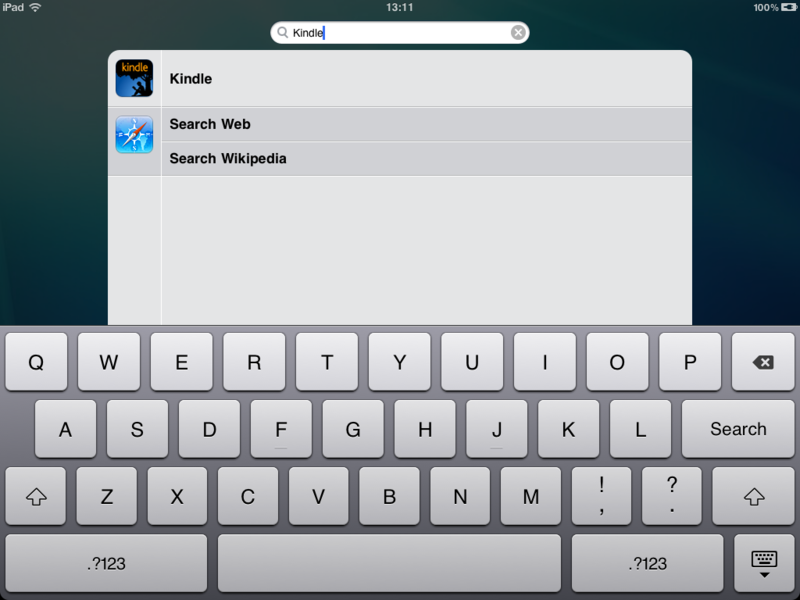 Whenever I need to search for a note I’ve made in the Notes app or a specific e-mail, I also use Spotlight search. Also, remember that double-clicking the Home button shows the apps you’ve recently used. You can run them from there, too. If the app is multitasking-enabled, it will load fast and show the last state the app was in. As you’d imagine, I’m a huge fan of folders. My Internet folder has Safari, Twitter, Flipboard, Reeder and other apps that rely on an Internet connection to operate. Since the folder stays open after I close the app, it’s very easy to quickly run through my Twitter and RSS feed routine. Even though my e-book readers are in my Reading folder, I’ll usually run Spotlight to open them. Same with Pages and the other iWork apps. Try out a few different folder setups and workflows, and I guarantee you’ll find that folders make your life with the iPad or iPhone is easier. These “new” features from Apple, have been available on Jailbroken iPhones for some time, in fact Folders in Folders is possible on my jailbroken iPhone4. Many more icons per page and various icon layout options are easy … blah blah blah. Sorry, am I raving a little? I had trouble with my iPhone 3GS, it was talking every time I touched it, but it wouldn’t do anything else. I restored it, and it downloaded the current I phone update, I think it is 4.6. Anyway now my apps won’t stay in their folders, I just turned it on and all the work io did is gone. Does anyone know what’s going on. I’ve been using my iPhone for two years without any problems. ISO 4, I had no trouble with. Any suggestions would help! Thanks. Hi Mark, I love your blog and I am really glad to see your have reached the same conclusion I did. Folders >>Homescreens. I personally moved all folder less than a month after I got my iPhone 4 last november. I was using an iPhone 2G before that. I have only 1 home-screen now – All folders. Everything app exactly 2 taps away. I have a couple more suggestions for getting even a better looking homescreen than this. 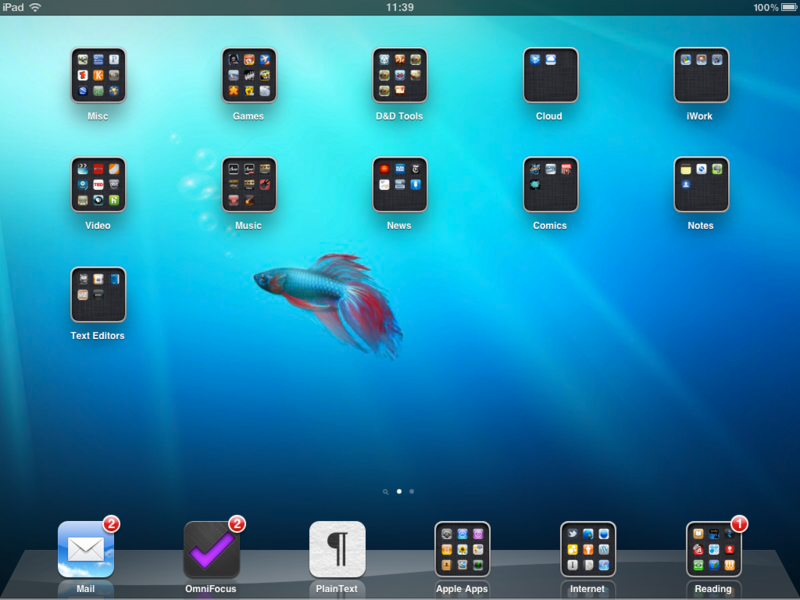 You can put folders on your “dock”?! Cool. That alone was worth the time spent reading this article. That seems like too many folders to me. It’s hiding too much. I try to use only 1 or 2 folders per screen. Spotlight doesn’t care. Isn’t that the Windows beta fish? Or… put single icons of all the stuff that you use most on the first screen, and everything else you don’t use as often in folders/categories on the second screen. For the iPhone, put the most used stuff near the bottom, where you can hold it and launch your most important apps with one hand. Yes, I’m an engineer and I over-think some things. yeah, on the iPhone I do that. My chief problem on the iPad is there’s a ton off apps that used a lot, but are nicely categorized. For instance, “Reading” In there are the four ebook apps, Zinio, Instapaper, the Wired app, and that’s where I stuck the Weber grill app. That would be almost an app screen itself, but for me it’s more convenient to have them in the one folder. Same with “internet” apps. I’ll check twitter on my iPad and almost immediately check RSS with Reeder. My iPhone is different. I have the icons for Photos, Camera, my WoW authenticator and MLB at bat out on the home screen. On the iPad, I like everything being on one screen for some reason. Damn, sorry. Didn’t mean to throw that big link in. Google Windows 7 beta wallpaper and you’ll get the image. Google “windows beta wallpaper”! Seriously. If it weren’t for those iOS folders, it looks just like windows. Mark, why did you use a Windows wallpaper for your iPad?